The “Reel Journalism” series is an idea produced by Clooney in conjunction with his role as “Distinguished-Journalist-in-Residence.” The series aims to educate the general public on how journalists make their choices and the public perception of the outcomes of those actions. Clooney chooses movies as the medium to portray this vital lesson and is known for playing to a packed house, which is often times sold out. 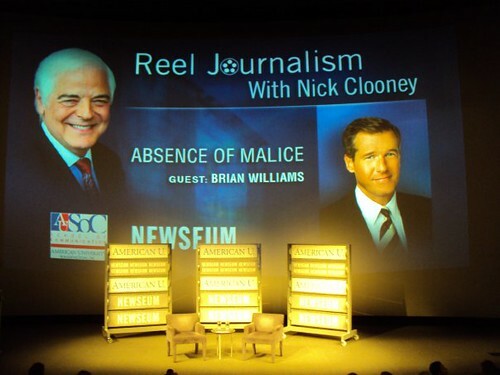 Clooney, the author of Movies That Changed Us: Reflections on the Screen hosted the pre-film, played moderator to a panel of one (composed of NBC Nightly News anchor Brian Williams). Granted, Williams had to be shuttled straight from the NW location of NBC Washington (where he anchors the NBC Nightly News) in response to earthquake in Haiti yesterday. Michael Colin Gallagher is the son of a long dead Mafia boss who is a simple liquor warehouse owner. Frustrated in his attempt to solve a murder of a union head, a prosecutor leaks a false story that Gallagher is a target of the investigation, hoping that he will tell them something for protection. As his life begins to unravel, others are hurt by the story. Megan Carter, the reporter, is in the clear under the Absence of Malice rule in slander and libel cases. Knowing nothing to trade to the prosecutors, Gallagher must regain control of his life on different ground. There is always a Q&A following the film shown at the event. People asking the questions are often in the demographic closely associated with the movie’s original demographic during its debut. I suppose that’s the “nice” way of saying how obvious it was that the folks asking the questions last night looked about the right age to have seen the 1981 film in theaters and remember that era of American history like it was yesterday. So I took it upon myself to ask Mr. Williams a question. “Romance aside, how do you think the whole movie would have played out had Megan’s character been a man?” Williams didn’t have a quick or final answer for me — I can’t say I’m surprised because really, who would? — but even asking the question was answer enough. What do I think the answer is? Everything would have been different, duh. But that’s not all — the real answer is that we as Americans have the right to ask the tough questions – whether man or woman, young or old. But I can’t lie — I did maintain a certain sense of satisfaction in the fact that Williams said I deserved my SOC degree after having asked the question. If I can gain the respect of the face of NBC Nightly News, I’ll take that and run with it. 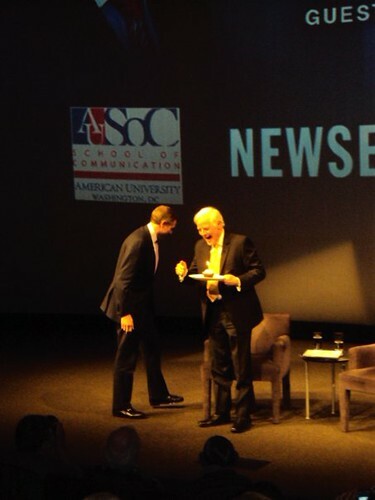 Thank you, Newseum. The Newseum isn’t cheap. Adult admission is $19.95 with tax. And that’s not even mentioning the cost of a ticket to the “Reel Journalism” ticket itself. But think about it. Think about what you’re getting for that price. 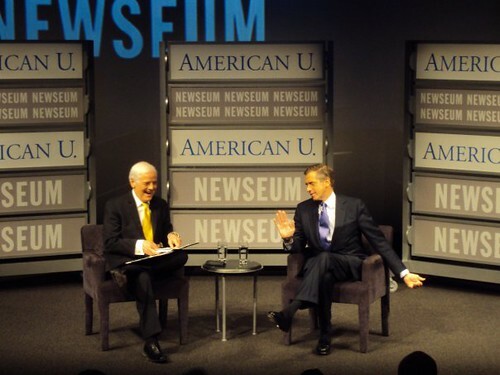 Go to the Newseum. I beg you. It’s worth every penny. What’s that, you don’t have a penny? Well find one dammit – this is history (past, present, and future) right at your fingertips as America saw it, sees it, and believes it. My grandfather would harp on me everyday of my four-year stint in journalism school to read the paper. The fact that I may or may not have done so (much to the chagrin of my favorite professors and family) does not mean I didn’t feel I had a civic responsibility to do so. They weren’t kidding when they told you “knowledge is power.” To know what is going on in the world around is you half the battle. If you want to fight for anything worth fighting for, it’s simple to do so — just read the news. Educate yourself. And you can start by going to the Newseum. Plus — what could be better than seeing one of America’s favorite movie buffs get all excited over a birthday candle in a cupcake? And with that said … Happy 75th Birthday, Mr. Clooney. May you be as young and jolly in heart, mind, and action for quite some time to come. All photos by Rachel Levitin. I am a fan of Brian Williams and I think NBC did a great job a choosing him. I will surely check out the Newseum. The better half and I went on Opening Day. The thing to like about it is the lack of crowds. The 4D theater is pretty cool too. I bought a Newseum hat and wear it proudly. 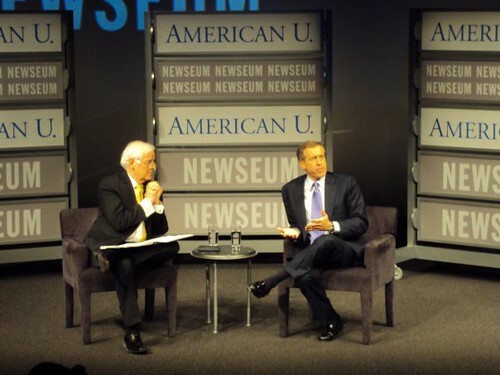 Huge fan of the Newseum since it opened – Not a fan of Brian Williams though. Everyone is entitled to their opinion, but a journalist should be able to give facts without personal feelings. I think that his newscasts are far too editorial, and try to focus more on Mr. Williams as a “personality” than a news broadcaster. Also, it’s remarkable that the national news, across the boards, gets the same amount of time (>24min) as the tabloid dribble shows that follows it, night after night.